Hello Loves! Just popping in with a quick review. 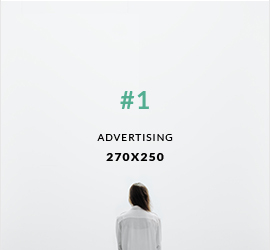 I know I mentioned I would be a little sporadic with my posting, but now I can tell you why! In a few weeks, I'll be joining the team at Artistic Expressions Hair Salon in Braselton, GA as their new in-house nail tech! I'm super excited and can't wait to start, but there is so much to do between now and then! You know, purchasing supplies, collecting MSDS sheets, planning services and prices, starting a business...whew. 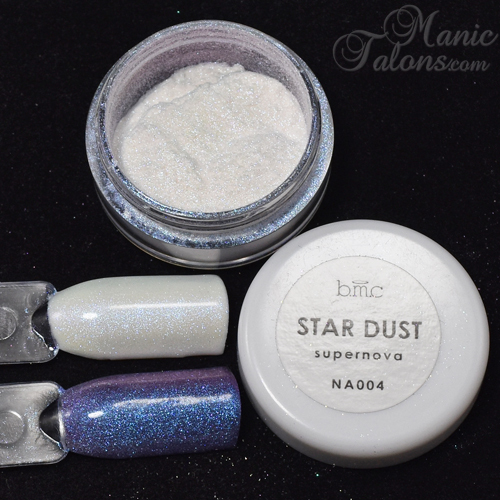 So I decided to take a quick break from all the planning to show you the BMC Stardust Pigment Collection. This collection consists of four pigments that are shifty and beautiful. 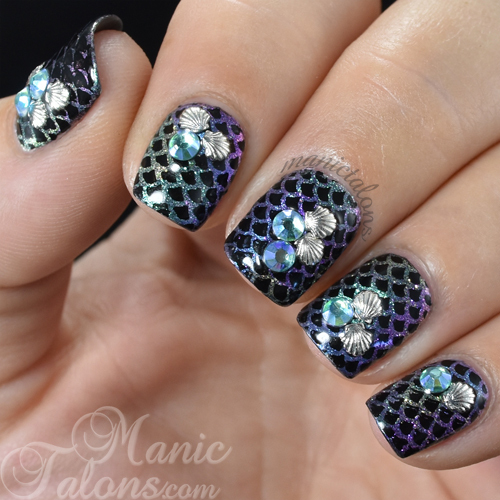 I originally planned to swatch them all for you on my nails, but time became a factor and to be completely honest, I started playing around and ended up with these gorgeous mermaid nails and I can't bring myself to take them off! 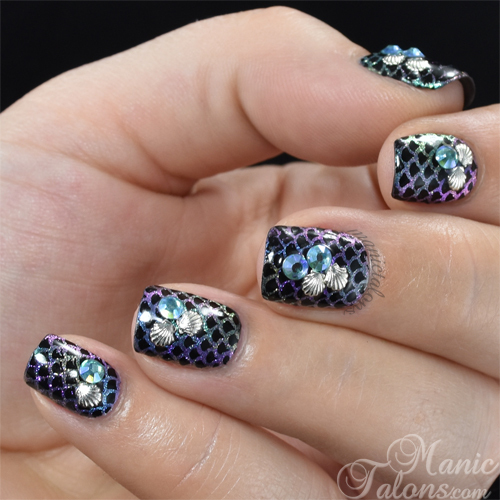 Let's start with some swatch stick swatches and end with my mermaid nail design. All of these pigments are iridescent shimmers that will look different over various base colors. I swatched them over black and white to give you an idea of the range they can create. They are very shifty and have duo-chrome qualities. 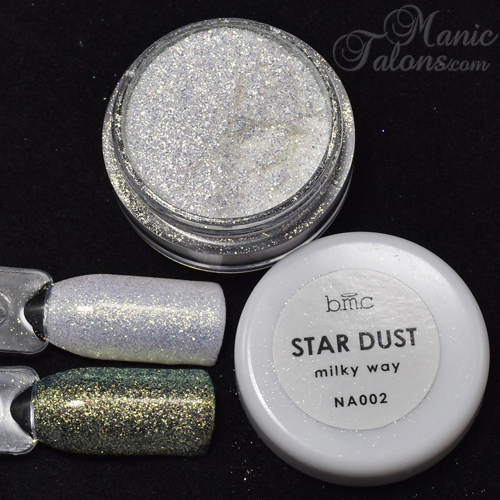 For these swatches (and the nail art), I scrubbed the pigments into the tacky layer of the base color. Let's start with Andromeda. I took the photos a little on the dark side to try and capture the shimmer over the white base. Andromeda has a pink to purple flash. Over black, she is bold and beautiful. Over white, she offers a soft shimmer that is only visible when the light hits it just right. As you can see based on the comparison between the pot and the swatch sticks, the pots are small. However, the pigments go a really long way! Milky Way is similar to Andromeda in that it provides a shift over black but more of a shimmer over white. It is different in that the shimmer and shift are golden and chunkier. Nebula has a green shift and is finer like Andromeda. It shifts through various shades of green and teal. 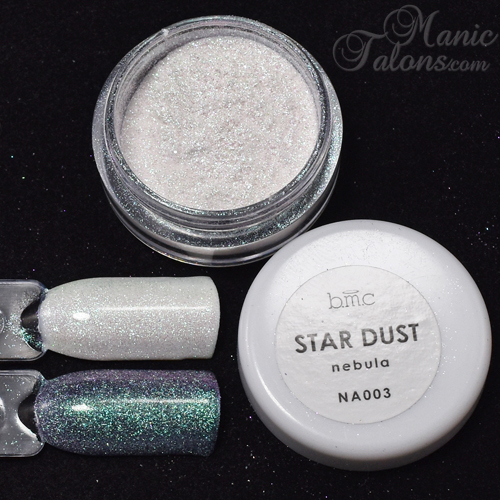 Finally, Supernova is the blue shimmer shifter of the collection. It is fine like Andromeda and shifts from blue to purple. 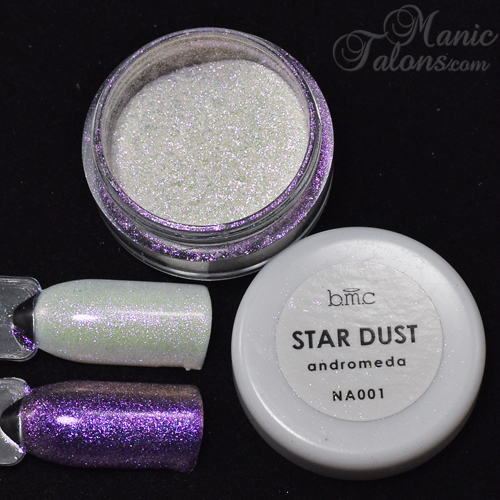 I am completely in love with the BMC Stardust Collection Pigments. In LOVE! There are endless possibilities here. 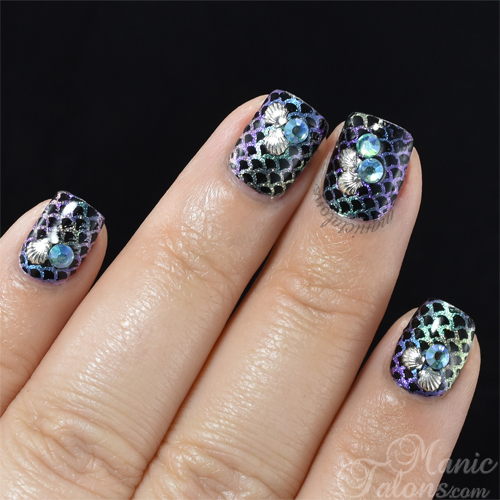 I can see myself layering them over various colors, mixing them with jellies and top coats, and creating all kinds of shimmery messes! 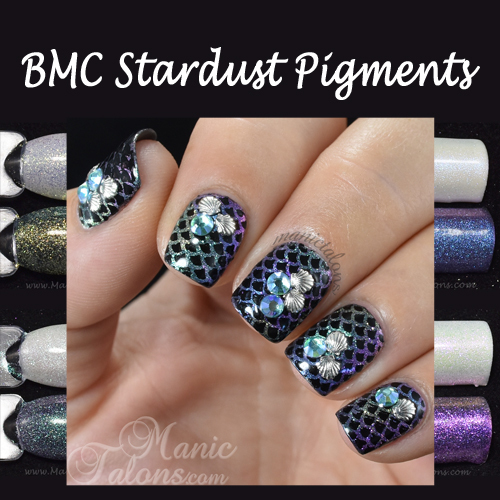 If you would like to add these gorgeous pigments to your collection, you can pick them up on Bundle Monster's Website here or on Amazon here.